Top sewn from scraps of a set of sharm-pack of «Stoff». I chose patches with coloring shirts, cut into triangles, assembled them in the strip, it has carved out the details necessary sizes to me. Also added Decovil seal - rayon cloth by padding, so the points gently inside. Bias binding of linen fabric. 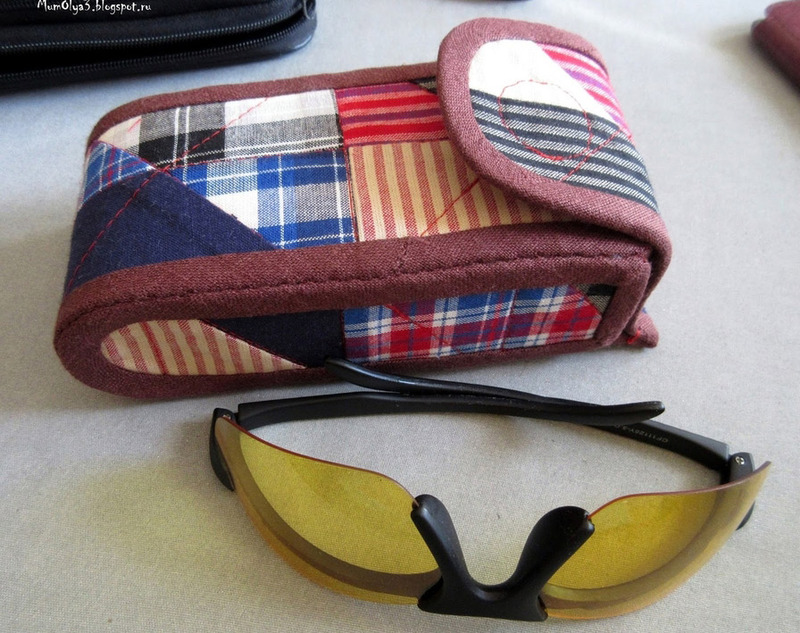 On the side is sewn a small pocket, such as wipes, which can wipe glasses. A small description of how I sewed cover. I measured the glasses, they are quite large, the amount in the amount of 15 x 4 x 6.5 cm (where 15 cm length on the lens, 4 cm - height of the lens, 6.5 cm - the widest distance between lenses (nose) to eyeglasses in folded state). The photo shows how to measure it. Long single cut piece includes - the front part of the cover, back, bottom and lid with a valve. The front and back cover, the length of points on the lens, that is, 15 cm x 2. Plus, the bottom and the lid, the height of the lens, respectively 4 cm x 2 Plus valve with a button - you can take a 5 cm plus 2 cm allowance. Total length of this part (15 x 2) + (4 x 2) + 5 = 43 cm + 2 cm = 45 cm. The width of the details is equal to the distance from the nose eyeglasses + 6.5 cm to 1 cm (allowance) = 7.5 cm. The two lateral details with a length of 15 cm + 1 cm allowance, width 4 cm (height lenses) + 1 cm allowance. We cut out the three details of all materials, that is, from the upper fabric (I have this patchwork fabric) from the lining of cloth, from Decovil. If you need a pocket, then cut out its any desired shape, need 2 details, sew them, gut-wrenching, ironing seam. Iron the edges Decovil to the top of the fabric. Fold the top of the sandwich cloth seal, napkins and lining fabric. We put a magnetic clasp. It is necessary to carefully calculate the location of its mounting to the valve and then closed as it should. If the button is set correctly, then it is either not correct at all, or very difficult. When the clasp is set, you can quilt detail. Details quilted, can once again all measure, trim the excess. I rounded the corners on the side panels, where is the bottom of the cover. On top of just a little squinted edge. Round the corners of the valve. Bias binding sew to cover the details around the perimeter. Wrenched to the side padding. Sew on the other hand a hidden seam. 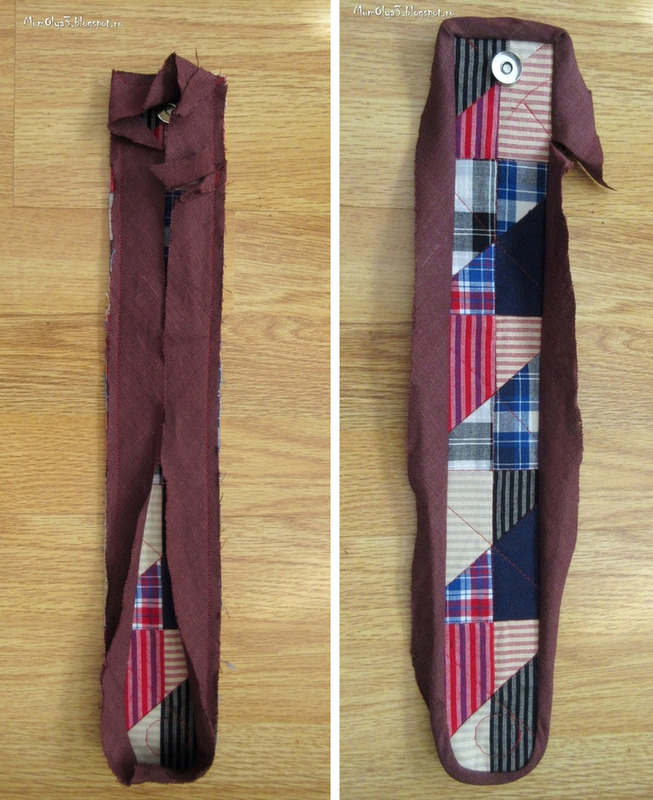 We combine details and collect Case - sew a hidden stitch details for bias binding. I make it a double thread.